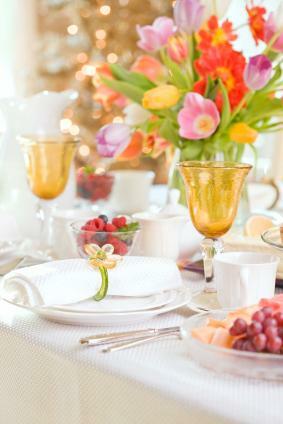 Serving just the right menu for a gourmet Easter dinner can make this spring holiday special for your family and guests. By taking traditional Easter foods and adding a little bit of gourmet flair, you can celebrate the holiday in style. When paired with the perfect wines, your sublime gourmet meal may just become an Easter classic. This four course menu for a gourmet Easter dinner features appetizers, salad, a main dish and sides and a delicious dessert. Scallops make a perfect bite-sized appetizer. As an added bonus, they fit nicely on a toothpick. For your Easter dinner appetizer, try these delicious bacon-wrapped scallops with garlic mayonnaise. Serve with a crisp Champagne or a light Pinot Grigio. Wrap each scallop with bacon and secure with a toothpick. Place scallops on a baking sheet and drizzle with olive oil. Broil for about 10 to 15 minutes until the bacon is cooked, turning once during cooking. While scallops cook, mix together mayonnaise and garlic, adding garlic one clove at a time, to taste. Serve scallops hot, to be dipped in the mayonnaise. For the salad course, use fresh spring greens and Greek salad dressing or balsamic viniagrette If you'd like, toss in some herbs, such as fresh basil. This salad will hold up well to a spicier white wine, such as Gewurztraminer or a Kabinett Riesling from Germany. Lamb is a popular Easter main dish, and asparagus is at the peak of freshness between March and May. For your main course, serve this delicious herb-crusted rack of lamb with a side of lightly grilled asparagus. If you'd like a starchy side, consider making mushroom risotto with truffle oil, which will complement the flavors in the lamb perfectly. Serve your main course with an earthy Oregon Pinot Noir or a well-aged Barolo from Italy. Score the surface of the lamb fat on the meat side of the lamb in a diamond shaped pattern. Season lamb with salt and pepper and place meat side up on a baking sheet. In a food processor, chop thyme, parsley and garlic until minced and well-combined. Put softened butter, bread crumbs and herb mixture in a small bowl and mix until well-combined. Press the bread crumb mixture onto the meat side of the lamb. Roast about 30 minutes, until the lamb reaches 135 degrees fahrenheit. Allow the lamb to rest for 15 minutes before serving. For dessert, serve gourmet Easter cookies or crème brûlée. Both will pair well with a nice Sauternes sweet wine from the Bordeaux region of France. Why not make your next Easter dinner a gourmet dinner? With the perfect combination of food and wine, you'll create a meal your guests won't soon forget.